Nasa has given an indication of the companies it thinks may be closest to offering commercial systems to carry American astronauts into space. With its shuttles about to retire, the agency has offered $270m (£166m) of funds to four firms to help them mature designs for new orbiting vehicles. Blue Origin, Boeing, Sierra Nevada Corp and SpaceX hope to sell astronaut "taxi" services to Nasa by mid-decade. Until then, US crews will have to go to the space station on Russian rockets. "We are pleased to be completing a significant milestone today in the development of US commercial crew systems, and we are very excited about the future," said Philip McAlister, acting director of commercial spaceflight development at the US space agency. "We hope someday soon we will see commercial human spaceflight to low-Earth orbit as a robust, vibrant, profit-making, commercial enterprise with many providers and a wide range of public and private users." The winning companies have a range of concepts under development. SpaceX, which has garnered much publicity recently, is perhaps the most advanced in its plans. The Hawthorne, California, company has already flown a rocket called Falcon 9 and a capsule called Dragon. It is being offered $75m over the next year if it meets certain targets in advancing Dragon's crew-carrying capabilities. The long-established Boeing company stands to win the largest award depending on its achievement of goals set by Nasa. Boeing's Houston, Texas, team has a capsule design called CST-100 which could transport up to seven astronauts to the space station. The $92.3m support on offer will help the company get the vehicle through to a key, or preliminary, design review. Sierra Nevada Corporation (SNC) of Louisville, Colorado, has already received considerable financial support in Nasa's Commercial Crew Development (CCDev) effort. It is now in line to get a further £80m in the latest round of funding. 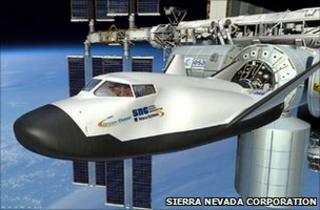 SNC is developing a shuttle-like vehicle called the Dream Chaser that would launch atop a rocket. The fourth recipient, Blue Origin, of Kent, Washington, is a company set up by Amazon.com founder Jeff Bezos. Blue Origin has kept much of its space development activity secret, but it has requested funds from Nasa to help it mature systems for a cone-shaped crew vehicle. It has been awarded up to £22m. Perhaps just as interesting as the companies that have won awards are the companies that have missed out. These include ATK which makes the solid-fuel rocket boosters (SRBs) that lift the space shuttle off the ground. ATK wants to marry an evolution of these SRBs with the main core stage of Europe's Ariane 5 rocket. The concept, known as Liberty, would be used to launch other companies' capsules and spaceplanes. ATK will now have to secure funds elsewhere if it wants to carry the Liberty idea forward. Also missing out on CCDev money is United Launch Alliance (ULA). This is the company that operates Atlas and Delta rockets for the US Air Force and for Nasa. These vehicles frequently orbit satellites, but ULA believes the rockets could be modified to launch humans also. Sierra Nevada, Boeing and Blue Origin had all talked about using an Atlas 5 to loft their proposed crew ships. Where Monday's announcement from Nasa leaves ULA's plans is uncertain. Again, it will need to use its own funds or find a partner if it wishes to continue with the project to man-rate the Atlas and Delta rockets. The CCDev process is not a down-selection, so it is conceivable ULA could get an award in a further round. "Given enough time and money I am confident that multiple US companies could develop safe, reliable and cost effective commercial crew transportation systems," Mr McAlister said. "And it is my sincere hope that the companies not selected for award today will continue maturing their systems and making progress on their designs so that they can potentially be available at some point in the future for purchase by Nasa and other customers." Nasa awarded about $50m in its first round of commercial crew contracts. It plans to substantially increase this funding next year to $850m. There is still much debate, particularly in the US Congress, about the readiness of the private sector to provide safe crew transportation systems. There are also doubts over whether the procurement strategy will deliver significant savings to the US taxpayer. But John Gedmark, executive director of the Commercial Spaceflight Federation, was adamant that Nasa was now on the only sustainable path forward. "Leveraging private investment is the only way Nasa can make its dollars go farther in these times of belt tightening," he said. "And by investing in commercial spaceflight rather than continuing to send billions of dollars to Russia, Nasa's commercial crew programme is creating American jobs instead of sending them abroad."